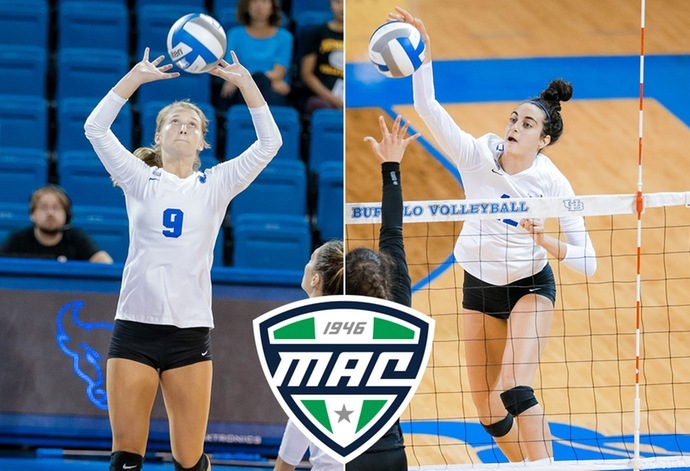 BUFFALO, N.Y. -- Following a perfect 2-0 week on the road, the University at Buffalo volleyball team earned a pair of weekly recognitions as sophomore Andrea Mitrovic was named the MAC East Offensive Player of the Week, while junior Scout McLerran was named the MAC East Setter of the Week. For Mitrovic, this is the third time in six weeks that she has been named the East Offensive Player of the Week. She was dominant this weekend as the Bulls picked up a pair of road victories. On Sunday, Mitrovic set a new school record for kills in a match as she had 34 kills in the 3-2 win at Kent State. The 34 kills broke a 23-year old school record set back in 1995. She also added 16 digs and four blocks in the victory over the Golden Flashes. 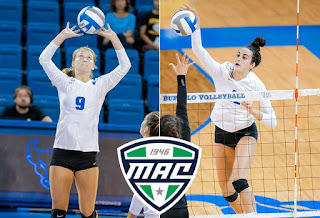 It was the second time in as many matches that Mitrovic had set a career high for kills as she had 25 in Buffalo's 3-2 win at Ohio on Friday night, which was UB's first ever win at the Convocation Center. For the weekend, Mitrovic averaged 5.9 kills per set and 6.55 points per set. For the year, she is averaging just over 4.3 kills per set. For the fourth time in six weeks a UB setter has earned MAC East Setter of the Week honors and for the second time this year that belongs to McLerran. She rejoined the starting lineup this weekend and helped guide the Bulls to a pair of road victories as she averaged 10.30 assists per set. She began the weekend with 47 assists in the five-set win at Ohio on Friday and she also added six kills and 14 digs against the Bobcats. On Sunday, McLerran had 56 assists in the win at Kent State, while also finishing with four kills and 12 digs. McLerran moved into sixth place on UB's career assists list. The Bulls will close out their three-match road trip on Thursday night when they face Akron at 7pm on ESPN+. UB returns home on Saturday evening to host Ball State in a match that will be broadcasted on ESPN3.